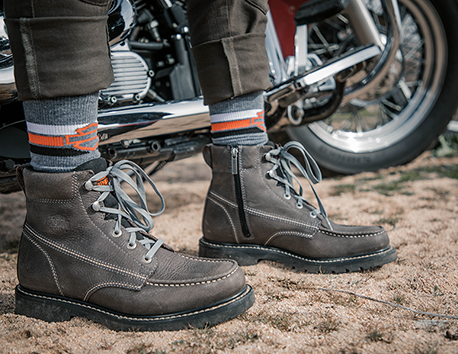 This collection of durable men's motorcycle boots was made for the open road. Classic Harley-Davidson styling has extra tough details to stand up to the test. With rubber slip resistant outsoles for superior traction on oil and water, and Goodyear Welt construction, these moto boots provides superior wear no matter where your adventures take you. Full-grain leathers are abrasion resistant and shield against heat, dirt and debris on the road. Let these performance boots stand up to the test of time... and distance.